Examples of everyday heat engines include the steam engine and the internal combustion engine. The stirling engine is also heat engine, as well as the drinking bird toy. All of these heat engines are powered by the expansion of heated gases. The Hadley system provides an example of a heat engine. Hadley circulation is identified with rising of warm and moist air in the equatorial region with descent of colder air in the subtropics corresponding to a thermally driven direct circulation, with consequent net production of kinetic energy. is negative; in any reversible work-extracting process, entropy is overall not increased, but rather is moved from a hot (high-entropy) system to a cold (low-entropy one), decreasing the entropy of the heat source and increasing that of the heat sink. The reasoning behind this being the maximal efficiency goes as follows. It is first assumed that if a more efficient heat engine than a Carnot engine is possible, then it could be driven in reverse as a heat pump. Mathematical analysis can be used to show that this assumed combination would result in a net decrease in entropy. Since, by the second law of thermodynamics, this is statistically improbable to the point of exclusion, the Carnot efficiency is a theoretical upper bound on the reliable efficiency of any thermodynamic cycle. By its nature, any maximally efficient Carnot cycle must operate at an infinitesimal temperature gradient; this is because any transfer of heat between two bodies of differing temperatures is irreversible, therefore the Carnot efficiency expression applies only to the infinitesimal limit. The major problem is that the objective of most heat-engines is to output power, and infinitesimal power is seldom desired. As shown, the endo-reversible efficiency much more closely models that observed. Increase the temperature difference in the heat engine. The simplest way to do this is to increase the hot side temperature, which is the approach used in modern combined-cycle gas turbines. Unfortunately, physical limits (such as the melting point of the materials used to build the engine) and environmental concerns regarding NOx production restrict the maximum temperature on workable heat-engines. Modern gas turbines run at temperatures as high as possible within the range of temperatures necessary to maintain acceptable NOx output. Another way of increasing efficiency is to lower the output temperature. One new method of doing so is to use mixed chemical working fluids, then exploit the changing behavior of the mixtures. One of the most famous is the so-called Kalina cycle, which uses a 70/30 mix of ammonia and water as its working fluid. This mixture allows the cycle to generate useful power at considerably lower temperatures than most other processes. Exploit the physical properties of the working fluid. The most common such exploitation is the use of water above the critical point, or supercritical steam. 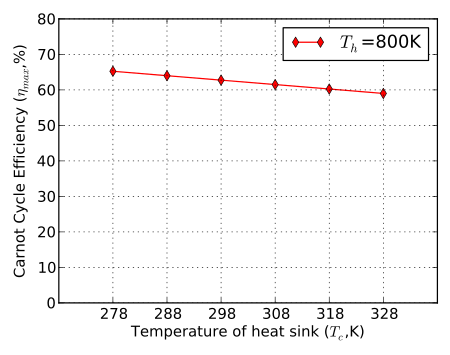 The behavior of fluids above their critical point changes radically, and with materials such as water and carbon dioxide it is possible to exploit those changes in behavior to extract greater thermodynamic efficiency from the heat engine, even if it is using a fairly conventional Brayton or Rankine cycle. A newer and very promising material for such applications is CO2. SO2 and xenon have also been considered for such applications, although SO2 is toxic. ^ Fundamentals of Classical Thermodynamics, 3rd ed. p. 159, (1985) by G. J. 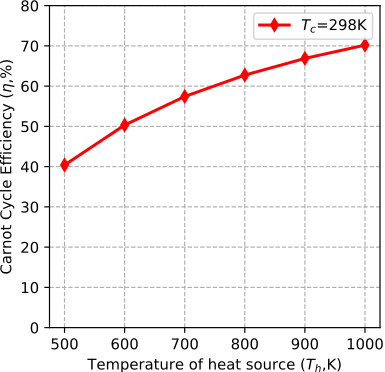 Van Wylen and R. E. Sonntag: "A heat engine may be defined as a device that operates in a thermodynamic cycle and does a certain amount of net positive work as a result of heat transfer from a high-temperature body and to a low-temperature body. Often the term heat engine is used in a broader sense to include all devices that produce work, either through heat transfer or combustion, even though the device does not operate in a thermodynamic cycle. The internal-combustion engine and the gas turbine are examples of such devices, and calling these heat engines is an acceptable use of the term." ^ Mechanical efficiency of heat engines, p. 1 (2007) by James R. Senf: "Heat engines are made to provide mechanical energy from thermal energy." ), "When the engine performs work, on the other hand, no entropy leaves the engine. This is problematic. We would like the engine to repeat the process again and again to provide us with a steady work source. ... to do so, the working substance inside the engine must return to its initial thermodynamic condition after a cycle, which requires to remove the remaining entropy. The engine can do this only in one way. It must let part of the absorbed heat energy leave without converting it into work. Therefore the engine cannot convert all of the input energy into work!" ^ Eman, Mahmod Mohamed (June 2013). "Experimental Investigations on a Standing-Wave Thermoacoustic Engine" (PDF). ResearchGate. Giza, Egypt: Cairo University. Retrieved 21 January 2018. ^ Langston, Lee S. "Efficiency by the Numbers". ASME. Archived from the original on 16 June 2009. ^ "Ericsson's 1833 caloric engine". hotairengines.org. ^ Lindsey, Rebecca (2009). "Climate and Earth's Energy Budget". NASA Earth Observatory. ^ Junling Huang and Michael B. McElroy (2014). "Contributions of the Hadley and Ferrel Circulations to the Energetics of the Atmosphere over the Past 32 Years". Journal of Climate. 27 (7): 2656–2666. Bibcode:2014JCli...27.2656H. doi:10.1175/jcli-d-13-00538.1. ^ "Stirling's 1842 air engine". hotairengines.org. ^ "Cyclone Power Technologies Website". Cyclonepower.com. Archived from the original on 19 January 2012. Retrieved 22 March 2012. ^ N. A. Sinitsyn (2011). "Fluctuation Relation for Heat Engines". J. Phys. A: Math. Theor. 44: 405001. arXiv:1111.7014. Bibcode:2011JPhA...44N5001S. doi:10.1088/1751-8113/44/40/405001. ^ F. L. Curzon, B. Ahlborn (1975). "Efficiency of a Carnot Engine at Maximum Power Output". Am. J. Phys., Vol. 43, pp. 24. ^ "Nuclear Reactors Concepts and Thermodynamic Cycles" (PDF). Archived from the original (PDF) on 18 March 2009. Retrieved 22 March 2012.